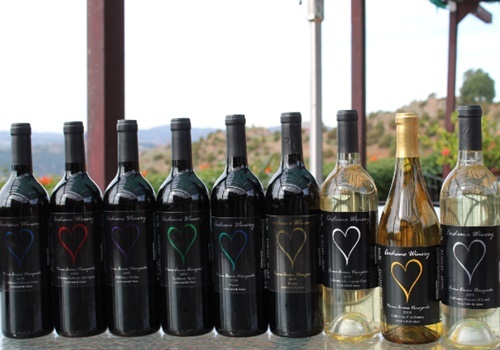 During one of our Escondido wine tasting tours, we had the pleasure to visit the Cordiano Winery, beautifully located on the hillside of the San Pasqual Valley. When we first arrived there, we learned that the winery is owned by a lovely Italian family, Gerardo, and Rosa and it represents their lifelong dream, where they invested a lot of passion, dedication, and hard-work. The Italian family chose to leave Italy behind and move to New York in the 70s. Gerardo’s first job on American land was at Pavone’s pizzeria, which later on he became the owner of. However, a visit to New Orleans determined the family to move to warmer Louisiana, where Gerardo opened a pizzeria chain called Dante’s Pizza, which became very successful growing to 35 locations. However, in the 90s, the family felt that they needed a change of scenery and decided to move to San Diego, where they opened an Italian restaurant. The restaurant was a flourishing business that led to the inauguration of other restaurants such as Buon Giorno, Donatello’s, Trattoria Paradiso, and Bell’Agio. But despite having had many flourishing businesses, Gerardo was still dreaming about following another life-long passion of his, winemaking, thus, he decided to sell the restaurants and dedicate his life to producing wines. In 2008, he opened his winery to the public making it possible for us to taste his delicious wines. Having said the lovely stories that lead to the inauguration of Cordiano Winery, let’s not forget the real reason that brought us here, the wine tasting. The wine menu at Cordiano Winery is diverse and you can find all the best assortments of wine from the elegant and well-balanced Pinot Noir, the dark and aromatic Merlot, or the smooth Zinfandel, to the light and crisp Sauvignon Blanc, Pinot Grigio and a combination of the two, Dueto Bianco. Additionally, for those of us who cannot resist the temptation of desserts, there are three different types of dessert wines available, namely a light and sweet Moscato di Canelli, an aromatic Snow White, and a dark Portofino, and don’t think that don Gerardo forgot about those of you who are looking for a more festive drink, sparkling wine is not missing from the Cordiano Winery menu. After learning about the delicious wines crafted here, and about don Gerardo’s career as a restaurant owner, you must wonder whether you will also find some exquisite Italian food to enjoy next to a glass of wine. The answer is yes, you will also be offered a food menu where you can find Italian pizza, salads, breadsticks, and even some irresistible Italian desserts, such as tiramisu and cannoli. We have to admit that we were famished when we got to the winery so we were delighted to find that the food menu perfectly complements the wine menu. We found that the pizza was delicious, especially the margarita and the veggie, as well as the homemade breadsticks, which we ordered several baskets of. In addition to the wine and the food, the atmosphere at Cordiano Winery was great; we really enjoyed the gorgeous views, the outdoor dining area, which was beautifully decorated, and all in all, it was a perfect day of relaxation and casual fun. This family-owned winery is the perfect place to end a great winery tour, a great place for a wide range of events, from weddings, to birthdays, to bachelor parties, and even a place where you can relax and enjoy an outdoor meal and a glass of wine. You can find additional details and information about the Cordiano Winery by visiting their website. The Aall In Limo & Pary Bus team offers Escondido wine tasting tours that include the family-owned Cordiano Winery. The relaxed and casual atmosphere, the amazing scenery, the wide range of delicious wines and Italian food make Cordiano Winery one of the most popular wine tasting locations. If you want to travel to this amazing winery in style, call us at 858-336-1894 and book your limo today.